UNRWA claims a number of 5 million Palestinian refugees, including in that figure every descendant of Arabs who fled Israel during Israel’s War of Independence. However, international law states that refugee status cannot be passed down to descendants, meaning that only the original 750,000 refugees of 70 years ago can be legally defined as refugees. Why is the US discussing cutting funding to UNWRA? Here are some fast facts, with Emily Schrader. UNHCR covers all refugees in the world EXCEPT Palestinians...and they have 1 staff for every 5,982 refugees. UNRWA, the agency exclusive to the Palestinians, has 1 staff for every 186 refugees. Does that sound proportional to you? PMW: What`s the connection between the new PLO Head of Prisoners' Commission and the 1993 World Trade Center bombing? US Ambassador David Friedman does not feel a sense of urgency to launch the Trump administration’s Israeli-Palestinian peace initiative anytime soon, and questions the extent to which Gaza can be resuscitated after 12 years under Hamas rule, the envoy recently said in an off-the-record call with an American Jewish organization. Journalists were on the call unbeknownst to the ambassador and published its contents on Wednesday. As first reported in Jewish Insider, the envoy said that no "timetable" exists for the release of their peace plan and clarified that President Donald Trump does not seek a reciprocal move by Israel after the US moved its embassy from Tel Aviv to Jerusalem in May. 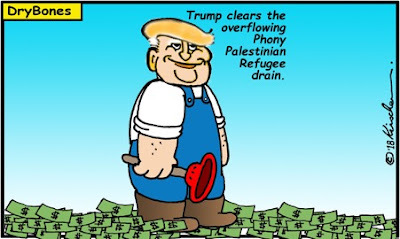 Trump, on a riff at a rally earlier this month, had suggested that Israel would pay a “higher price” for the embassy move in peace talks with the Palestinians. But regional powers are no longer pressing the administration to reassemble peace talks like they once were, Friedman said. He suggested that other issues – Iran’s activity chief among them – have taken priority. The peace initiative designed by two of the president’s closest aides – Jared Kushner, his son-in-law; and Jason Greenblatt, his special envoy to the conflict – is “not imminent,” Friedman said, according to the reports. He denied that the plan would be rolled out around the time of the UN General Assembly in New York next month. The US ambassador to Israel, David Friedman, addressed President Trump's remarks that Israel would have to pay a price for the transfer of the embassy. “The President feels that if the parties are lucky enough to be sitting in a room and making progress, he might say to the Israelis, ‘Look, can you do a little bit more? Look what we did for you. Is there’s something more that you could do?’ It’s not that he has something specific in mind, but just that under the circumstances that the United States has engaged in really significant good faith efforts to strengthen Israel and strengthen its historical multi-thousand-year connection to Jerusalem, maybe the Israelis could make it clear by leaning in a little bit as well. That’s all it meant… I was there when the [Jerusalem] decision was made. I was there watching it and advocating for it in real time." He also referred to the American peace plan in the conversation and said that its publication was "not imminent." The U.S. leveled harsh criticism at the Palestinian Authority on Wednesday for derailing Egyptian-led efforts toward a long-term cease-fire agreement between Israel and Hamas in Gaza. In a statement late Wednesday, U.S. Middle East envoy Jason Greenblatt said that "The Trump administration strongly supports the efforts of [Egyptian] President [Abdel-Fattah] el-Sissi and the Egyptian government ‎to help facilitate an agreement to restore calm in Gaza and bring about the conditions for the Palestinian Authority to fully assume its responsibilities in Gaza." "The Palestinian Authority cannot criticize from the sidelines," Greenblatt continued. "The Palestinian Authority should be part of the solution for the Palestinians of Gaza and Palestinians as a whole. If not, others will fill that void," he warned. "Leadership is about making hard choices," Greenblatt said, in a veiled dig at Palestinian Authority President Mahmoud Abbas. "The people of Gaza, and Israelis in the area around Gaza, have suffered for far too long. It is time for the Palestinian Authority to lead the Palestinian people – all Palestinians – to a better future." Greenblatt's statement comes days after Palestinian media quoted Abbas as voicing outrage at the Egyptian moves toward striking an agreement between Israel and Hamas. According to reports, Abbas described the emerging agreement as "a betrayal and a defiance of the [Palestinian] leadership." Despite a series of ostensibly conciliatory statements, Palestinian Authority President Mahmoud Abbas has not softened his stance on any of the core issues of the Israeli-Palestinian conflict, officials in Ramallah stressed this week. At the same meeting in his Ramallah headquarters, the Palestinian leader also said he believed a future Palestinian state should be demilitarized, offering rare backing for a key Israeli demand in any peace deal. “The president has been saying this not only since he was elected, but he has been saying this since the 1970s,” Elias Zananiri, the vice chair of the Palestinian Committee for Interaction with Israeli Society, told The Times of Israel on Thursday. Citing unnamed officials close to the PA chief, Channel 10 news reported that Abbas has suffered significant memory lapses in recent months and struggles to remember names and faces — including those of close associates. Furthermore, Abbas has experienced disorientation and a general feeling of weakness, the report said, and has significantly reduced his work load, only showing up at his office for two hours a day. He has a doctor on hand at his Ramallah headquarters, and the doctor checks him at least once a day, the report also claimed. An official in Abbas’s office swiftly denied the report. “The president has been coming to work regularly. He has been coming to work for four hours in the morning and early afternoon and then again in the evening for five hours,” the official told The Times of Israel. Arch-terrorist Marwan Barghouti, who is imprisoned in Israel, on Wednesday criticized the Palestinian Authority (PA) over its security coordination with Israel. Barghouti called for Hamas and Fatah to join hands at this time in order to deal with the challenges facing the Palestinians. He also expressed support for the establishment of a national unity government that would work to rehabilitate the Gaza Strip. Barghouti is serving several life sentences in Israel for his role in planning terrorist attacks against Israelis. During the night, IDF, Shin Bet, and police arrested 27 wanted terrorists in Judea and Samaria suspected of involvement in terror activities and riots. The suspects were interrogated by the General Security Service. During an IDF operation to locate weapons in the villages of Beitunia and Harela in Binyamin and Gush Etzion, fighters seized a homemade Carlo weapon and a pistol with a cartridge. The Carlo sub-machine gun is a crude imitation of the Swedish-made Carl Gustav recoilless rifle and is being manufactured in small workshops in Judea and Samaria. In addition, during the IDF Beit Rima activity a violent riot broke out where dozens of Arabs threw firebombs and a pipe bomb at the soldiers. The Ad Kann organization revealed documentation from a Combatants for Peace organization tour where residents of the a-Dik village in western Samaria claim that area settlers release wild boar into the village. An Ad Kann secret plant documented leaders of the tour, held four years ago in the village, describing how the settlers come at night with trucks full of of wild boar and release them in the village, and the damage that the animals cause residents and their crops. On tape a village resident speaks in Arabic as a Combatants for Peace interpreter describes to the people how the wild pigs harm the residents: "We're suffering. The peasants and the farmers suffer from the pigs spoiling their agriculture; the pig only looks for where there's dirt and garbage. Lately, the pigs have begun to enter the houses and the gardens of the houses." Later on, the interpreter explained that the settlers were the ones who brought the boar to the village, saying "the pigs that are here now are from the settlers, they brought them," and "we saw the truck bringing pigs. An Israeli truck carrying boars." In addition, a female resident spoke in Arabic, and the interpreter explained how she "saw a truck with pigs coming from the town of'Ali Zahav and released them into the village". The Iranian regime is the last revolutionary regime on earth. The ideologues who forcibly came to power in 1979, and remain in power today, are driven by a desire to conform all of Iranian society to the tenets of the Islamic Revolution. And the full achievement of the revolution at home and abroad is the regime's ultimate goal. We can see the effects of the revolutionary mindset across the Middle East, and even the world. The revolutionary worldview means that the regime cannot tolerate any ideas coursing through the veins of Iranian society that would threaten them. This is why the regime throws a teenage gymnast in jail for dancing on Instagram. Instead of using the wealth generated from the Iran deal (JCPOA) to boost the material wellbeing of the people, the regime grabbed it for themselves. And they use the money to line the pockets of dictators, terrorists and rogue militias. Iran provides Lebanese Hizbullah about $700 million per year. Iran has spent at least $16 billion on supporting its proxies in Syria, Iraq and Yemen. Iran has historically provided over $100 million per year to Palestinian groups, including Hamas and Palestinian Islamic Jihad. Iran has extended at least $4.6 billion in lines of credit to Syria. As a result of the failure of the Iran nuclear deal to effectively restrain proliferation, or to curb Iran's destabilizing behavior, on May 8 the president ended America's participation in the nuclear deal. Secretary Pompeo announced a new Iran strategy shortly thereafter with 12 objectives. And we have launched a multipronged pressure campaign that reflects his goal of protecting the American people and our allies and our partners from this outlaw regime. The goal of aggressive sanctions is to force Iran into simple but hard choices of whether to cease or persist in the policies that trigger the sanctions. Regime leaders should feel painful consequences for their violence and bad decision-making. We are asking every nation that can no longer tolerate the Islamic Republic's destructive behavior to protect its people by joining this pressure campaign. 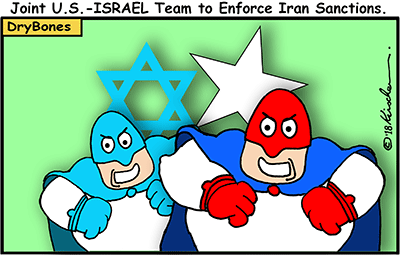 How should Israel respond if it can't stop Iran producing nuclear weapons? Though he strongly hopes that a variety of economic, diplomatic and as a last resort, military measures, can stop Iran from going fully nuclear, former deputy national security council chief Chuck Freilich also believes in planning for the worst. Speaking to The Jerusalem Post on Wednesday, Freilich updated some long-term ideas he had laid out in his recent book, Israeli National Security: A New Strategy for an Era of Change, regarding Israeli nuclear policy, in the worst-case scenario where Iran does some day obtain nuclear weapons. Freilich does not confirm nor deny the existence of an Israeli nuclear weapons program and his comments are based on foreign sources reporting that it has between 80 to a couple hundred nuclear weapons and maintains a “nuclear ambiguity” policy. Mostly, Freilich supports that policy – in which Israel does not formally declare its nuclear power, but leaks have provided its adversaries with enough information to deter them from certain levels of warfare. “If it’s just Iran, I would stay with the current policy. There would be no need for any change of significance [regarding ambiguity.] Israel’s own deterrent capability should be more than enough. If we are talking about a multi-nuclear Middle East, then I don’t think there is any good solution,” he said. In the 1962 classic Western “The Man Who Shot Liberty Valance,” a newspaperman famously tells the protagonist, portrayed by Jimmy Stewart: “When the legend becomes fact, print the legend.” And for more than half a century that is precisely what the press has done when it comes to the United States and Iran. The Islamic Republic of Iran likes to claim that the United States is solely responsible for toppling the democratically-elected Iranian leader Mohammad Mossadegh in a 1953 coup. According to this narrative, Iran’s anti-U.S. attitudes are understandable — even justified. And long after evidence has proven otherwise, many in the media and academia seem intent on echoing Tehran’s line. But when it comes to “misinformation,” it is Mr. Zarif who is an arch-purveyor. Iran continues to comply with the nuclear deal reached in 2015 with major powers even after the withdrawal of the United States, the United Nations’ atomic watchdog said Thursday in a confidential report. The conclusion comes as the other signatories to the 2015 deal — Germany, Britain, France, Russia and China — continue to try and salvage it after US President Donald Trump decided to pull the US out unilaterally in May. Iran's Supreme Leader Ayatollah Ali Khamenei on Wednesday cast doubt on the ability of European countries to save the 2015 nuclear accord with world powers, and said Iran might abandon the agreement. Khamenei urged President Hassan Rouhani not to rely too much on European support as he comes under increased pressure at home over his handling of the economy in the face of U.S. sanctions, with key ministers under attack by parliament. Following the U.S. pullout from the international accord on May 8, European powers have been scrambling to ensure Iran continues to get the economic benefits it needs to keep it in the deal, which had aimed to curb Iran's nuclear ambitions. But in comments published on his official website, Khamenei told Rouhani and his cabinet on Wednesday: "There is no problem with negotiations and keeping contact with the Europeans, but you should give up hope on them over economic issues or the nuclear deal. "The nuclear deal is a means, not the goal, and if we come to this conclusion that it does not serve our national interests, we can abandon it." In 2016, Lebanese singer Majida El Roumi, who has served as a U.N. FAO Goodwill Ambassador since 2001, said that she had read "The Protocols of the Elders of Zion" when she was young at her father's behest and that global Zionism "has a plan to fragment the Arab world in its entirety." El Roumi, who was speaking at the Beirut Arab University, said: "This notion is constantly in their heads: the kind of fragmentation of land that you see in various places, bullets flying in one place, rockets in another, bombings in France and elsewhere..." Her statements aired on the Lebanese Aghani TV channel on May 16, 2016.